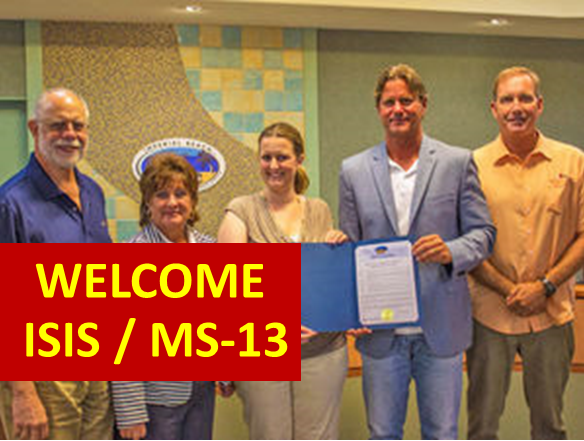 Mayor Dedina of Imperial Beach proclaimed it to be a Welcoming City, which puts it in the network of Welcoming Communities around the country, who are inviting questionable refugees, asylees and immigrants to move to their city. The Citizens of Imperial Beach, Ca fought back and had the proclamation retracted. When a city declares itself to be a “Welcoming City” they join a network of other welcoming cities. The far-left unions, nonprofits, pseudo-religious groups and community organizers, who are funded to support the Welcoming Cites effort, claim it will have not impact on the city. But it is like putting out a welcome mat for every “refugee” in the country to come and resettle in your community. Obama is using the refugee and asylum process to do an end-run around the immigration law. He has made it policy to accept just about anyone, who claims to be a refugee, give them a slip of paper with a court date and them let them loose in our streets to disappear. Most never intend to show up in court. The first thing we did was obtain video of the Imperial Beach City Council when the proclamation was made and upload it to YouTube, where a lot more people would see it. City Councils and the supporters try to keep this quiet. Exposing it to the light of day goes a long way in helping to overturn this obnoxious effort with the nice-sounding name. If you want to see all the video made about this situation in Imperial Beach, go to this YouTube playlist.